Single ply roofing systems are increasingly being used in the housing sector whether in new build or refurbishment. Examples range from contemporary new build low carbon homes which may also include green roof or renewable energy technology. Single ply roofing systems are also an attractive alternative for refurbishment of old traditional flat roofing materials, and can also be an economic and aesthetic solution to failed lead roofs. As featured previously, the versatility and durability of single ply roofing materials combined with their excellent sustainability credentials, are the reason for the rapid growth of the single ply industry in the housing sector. Have you struggled to get insurance on your property that has a single ply roof element? GGFi Ltd has developed a special buildings and contents insurance scheme, underwritten by certain underwriters at Lloyds, available for SPRA members’ domestic customers. There is also a ‘Contents-only’ basis scheme for people living in flats with Single Ply Roofing. To find out more click here or contact us on 01732 749 559. The house builder or householder is urged to follow the SPRA guidance documents . 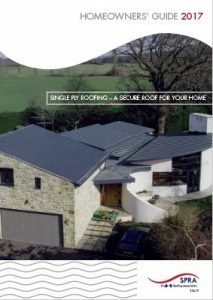 We recommend that you strongly consider using SPRA members for any single ply roofing works. The single ply roofing sector has seen an increase in non-audited materials into the UK for which we cannot provide any support to the homeowner in the event of any issues. You too can use this resource to help your private clients to understand the benefits of the single ply system and to promote the quality, reliability and experience of you as a SPRA approved contractor. Not a SPRA Contractor? Apply now. Please promote this guide to your approved contractors and to clients. We are all homeowners after-all! What is Single Ply Membrane ?